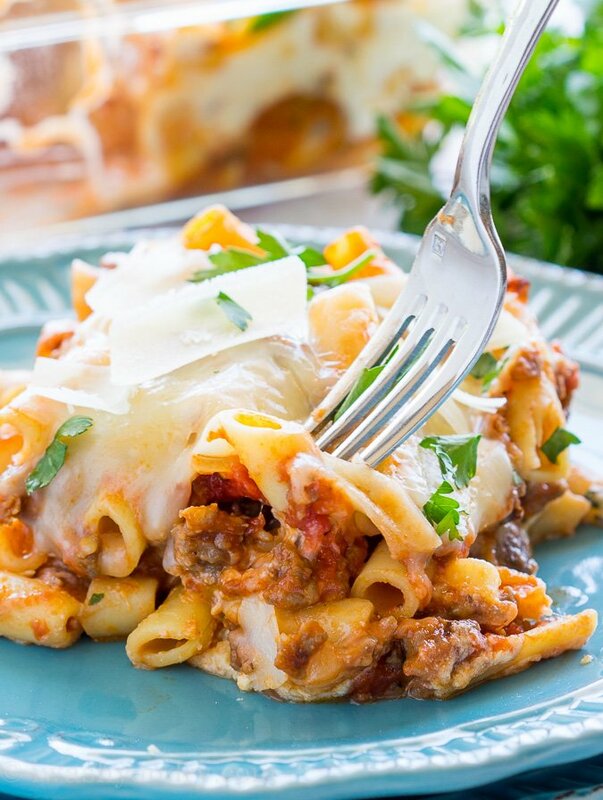 This Freezer Friendly Baked Ziti is a fantastic Italian casserole that’s filled with a meaty red sauce, tender ziti noodles and a creamy, cheesy filling! There is nothing quite as satisfying as knowing that you have dinner prepared and ready to go. But when plans fall through, it’s always nice to have a back up. 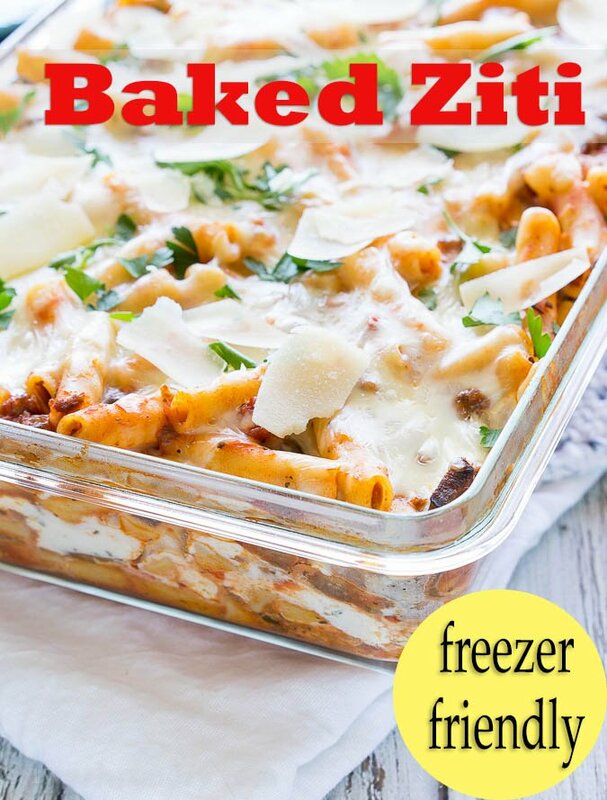 That’s what I love about this Freezer Friendly Baked Ziti! 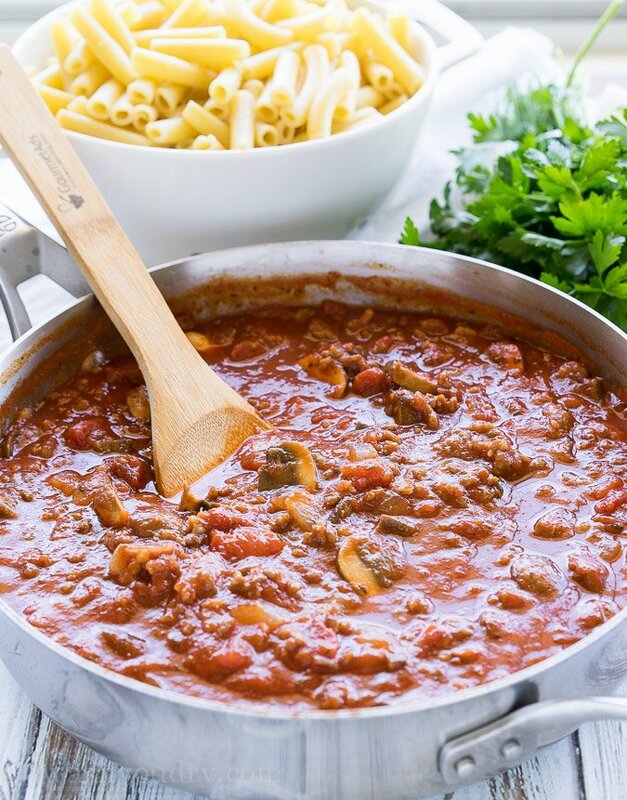 Start by making a super simple meat sauce, that’s very similar to my Quick Italian Meat Sauce. Brown some Italian ground sausage and mushrooms along with onion and garlic in a large skillet. Add in some diced tomatoes and tomato sauce and bring to a simmer. While the sauce is simmering away, you can boil your noodles and prepare your cheese filling. 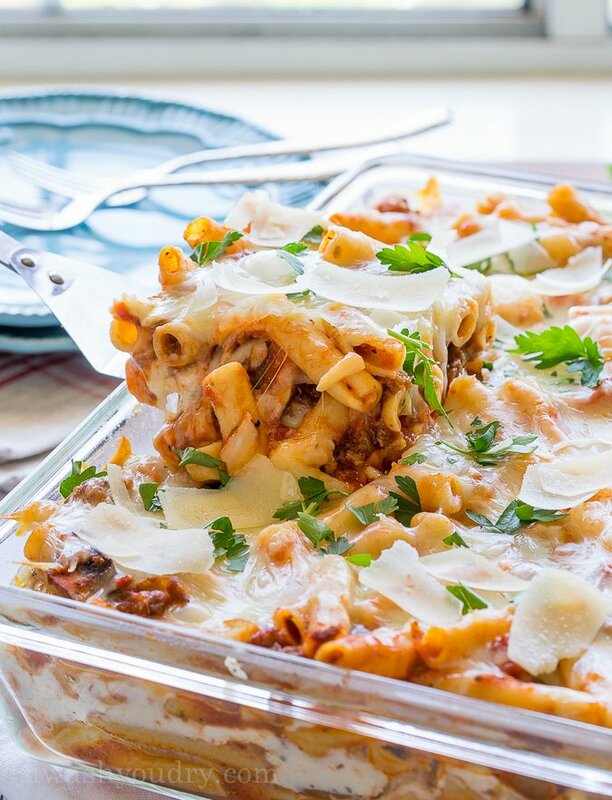 The traditional pasta used for baked ziti is Ziti, which is a long tube shaped noodle. 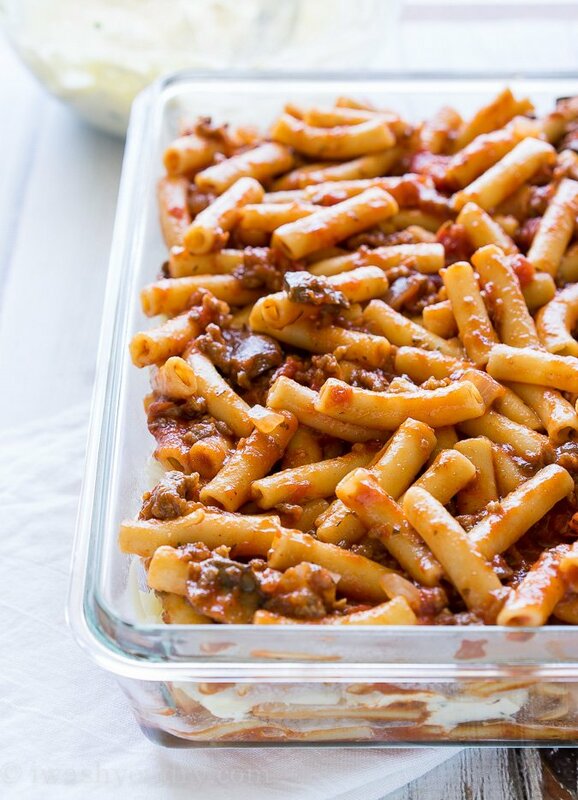 You can substitute the ziti for penne, macaroni, or any other small to medium shaped noodle. 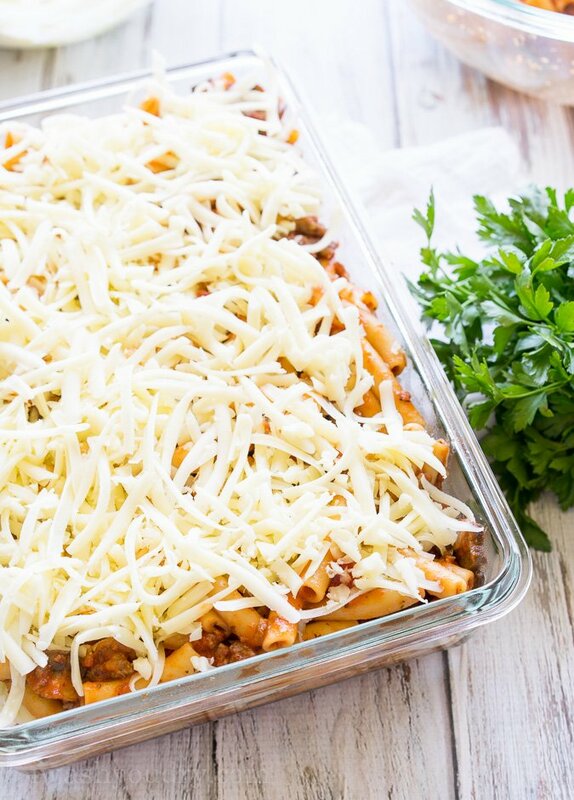 Not only is this delicious Baked Ziti ready for immediate baking, but it can also be packaged up and frozen for later use! When storing for later, make sure you cover the casserole dish tightly with aluminum foil. Sometimes I’ll double up on the foil to prevent freezer burn. 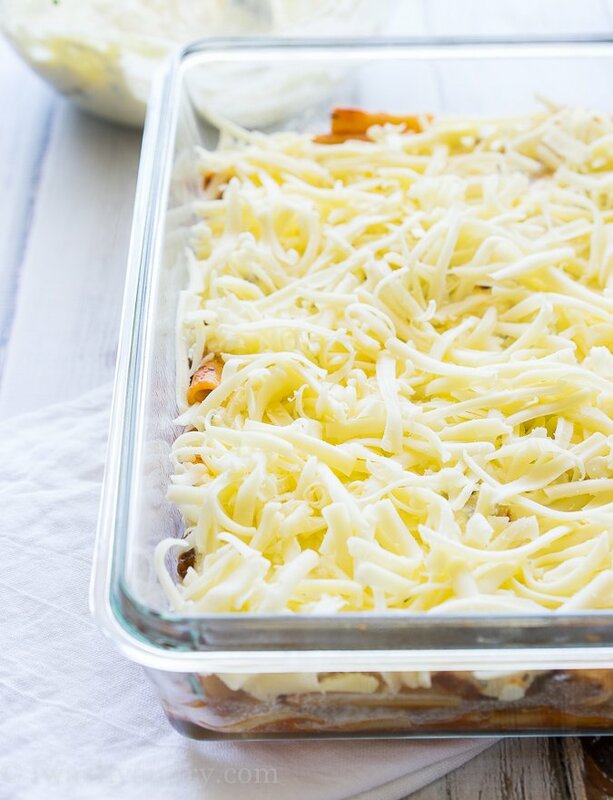 This easy casserole can last for up to 5 months in the freezer if it’s tightly packaged. Freezer prior to baking for best results. I couldn’t do baked ziti without having a layer of lasagna filling in between. It truly makes this dish pop. Combine some ricotta cheese, parmesan cheese, a couple eggs, a little salt and pepper and good dose of parsley. 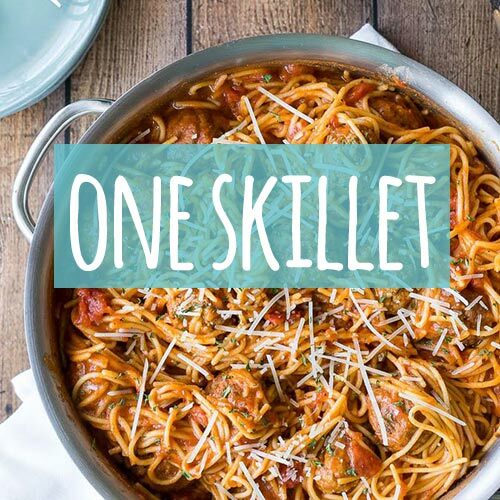 Start by combining your cooked noodles with the meat sauce and placing half the mixture in the bottom of a 9×13″ casserole dish. Spread a layer of the ricotta cheese mixture over the top. Top with a layer of shredded mozzarella cheese. Repeat with another layer of noodles and sauce! Follow that with another layer of cheese and you’re all set to either bake right away or pop it in the freezer for another day! 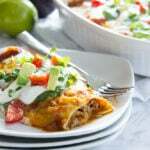 I love making freezer friendly casseroles for when I go out of town and the husband has to watch the kids. It’s so easy for him to just pop a dish in the oven, and it gives me peace of mind that they’re not just eating pizza and chips every night. Plus if I ever have a friend or neighbor in need of a good dinner, I can easily just grab one from the freezer and help them out! 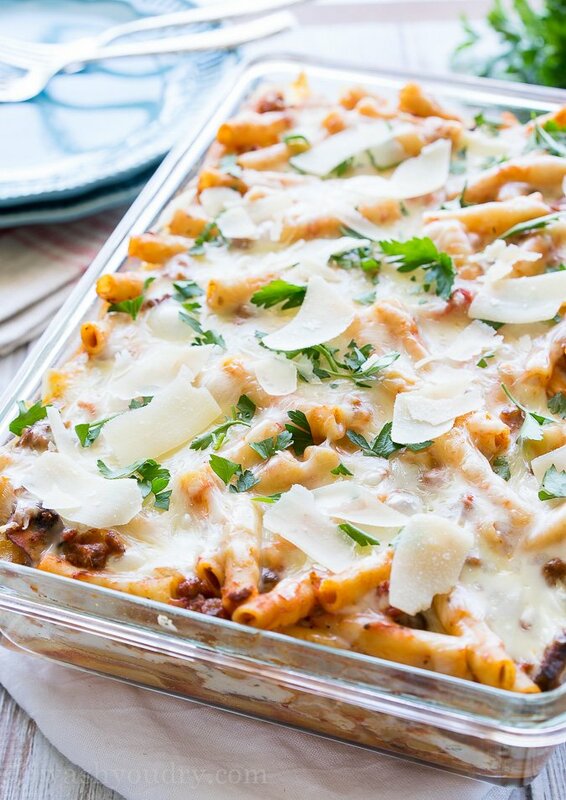 You’ll be making friends with everyone when they try this baked ziti! My husband and kids love this one so much. There are usually no leftovers, but when there are, I can just pop that lid right back on and place it in the fridge for leftover night later in the week. Yes, you can pop this casserole straight into the oven as long as it’s been prepared in an oven-safe casserole dish. 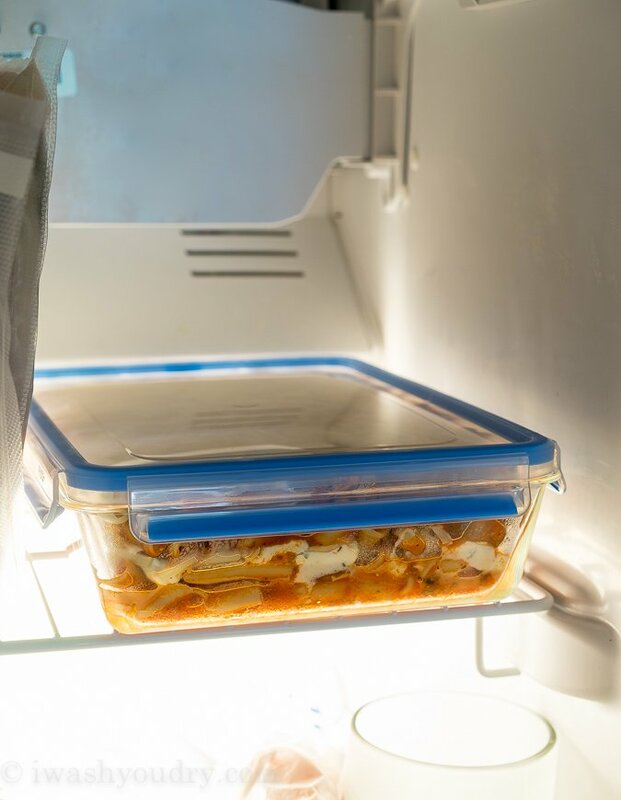 When frozen, take casserole out of freezer and remove lid or any plastic wrap. Cover with foil. Bake in 350 degree preheated oven for 1 hour, remove foil and continue baking for an additional 10 to 15 minutes, or until center is bubbly. Now who else wants a big slice of this yumminess!? Brown and crumble the sausage in a large skillet or dutch oven over medium high heat and add the onions and garlic, cooking until tender. Stir in the mushrooms and cook until softened. Add in the sauce, tomatoes and Italian seasoning. Bring to a gentle boil, reduce heat and simmer for 10 minutes, stirring occasionally. If your pan is big enough add the pasta to the sauce and stir to coat. If needed, transfer sauce and pasta to a larger bowl to stir together. 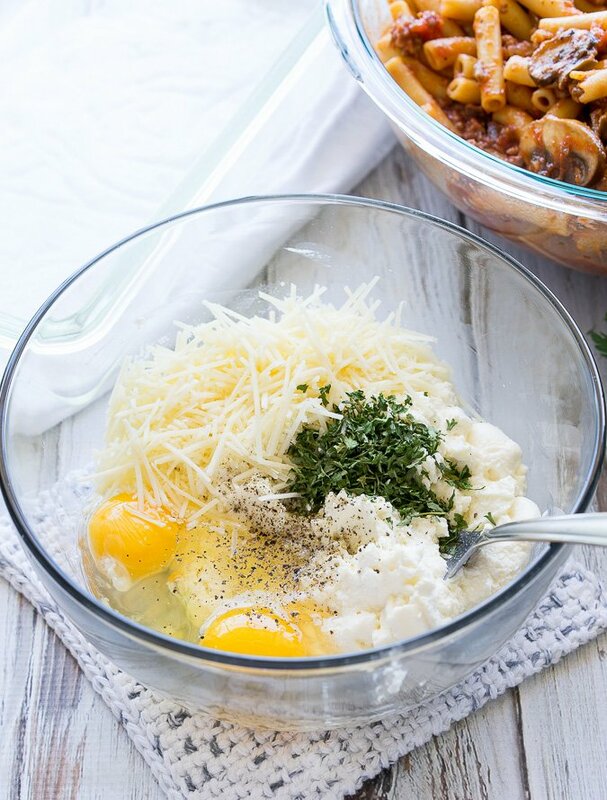 Combine the ricotta, parmesan, eggs, parsley, salt and pepper in a small dish. Lightly coat a 9×13″ casserole dish with non-stick spray. Layer half of the pasta mixture on the bottom of the casserole dish. Top with the cheese mixture and spread to an even layer. Sprinkle half of the shredded mozzarella cheese on top. Spread the remaining noodles and sauce over that, followed by the remaining mozzarella cheese. Cover with foil and bake in a preheated 350 degree oven for 25 minutes, then remove foil and continue baking for an additional 15 to 20 minutes, or until center is bubbly. Enjoy! Let cool to room temperature then cover with an airtight lid. If no lid is available, cover with plastic wrap and then a double layer of tin foil. Freeze. 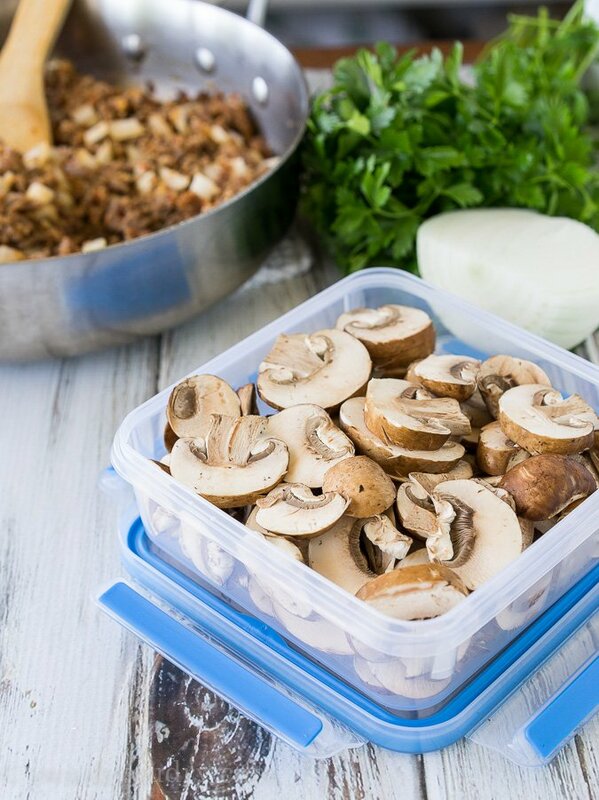 Take casserole out of freezer and remove lid or any plastic wrap. Cover with foil and let it sit on the counter while the oven is preheating. Bake in 350 degree oven for 1 hour, remove foil and continue baking for an additional 10 to 15 minutes, or until center is bubbly. Enjoy! I have edited the instructions to allow for this safety step. Thanks for the info! Hi. Can you substitute ground beef for the sausage? Thanks! I substituted ground beef for the Italian sausage and it was delicious! Delish! Definitely need to put one of these in the freezer! Can you tell me what brand of glass container you used. The one I have does not have a freezer-friendly lid. The plastic is more brittle and doesn’t seal well. I made this tonight and it’s amazing! 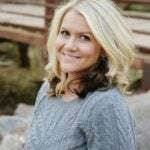 I’m freezing half for my maternity leave that starts at the end of February! Hi Shawn. 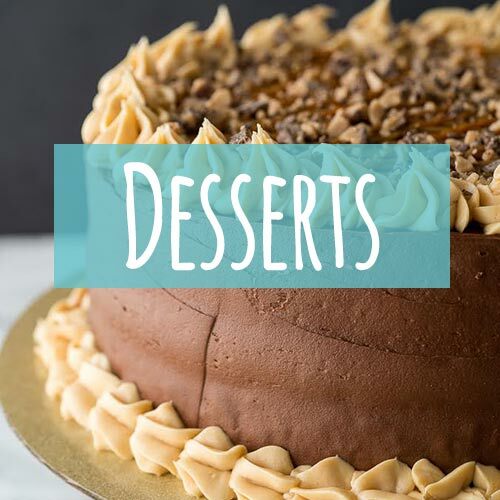 Thanks for sharing all of these yummy recipes. However, in your ziti recipe, it says to use one 24 oz jar of traditional spaghetti sauce…. is there one that you would suggest? Please? Hi Mary, my favorites are either Preggo or Hunts. Both are extremely affordable and delicious! How long would you say this dish could be frozen for? These types of things really worry me and I’d like to write the date down when freezing so I know how old the dish is. I’d say this would last at least 3 to 5 months in the freezer! 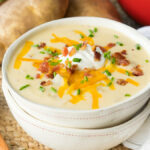 Looks so Yum I would never have any left to put in the freezer! But you bet I’m going to try!!! Thanks! I’ve made this recipe several times since stumbling onto this post a few months ago, and my whole family loves it! It is SO good. 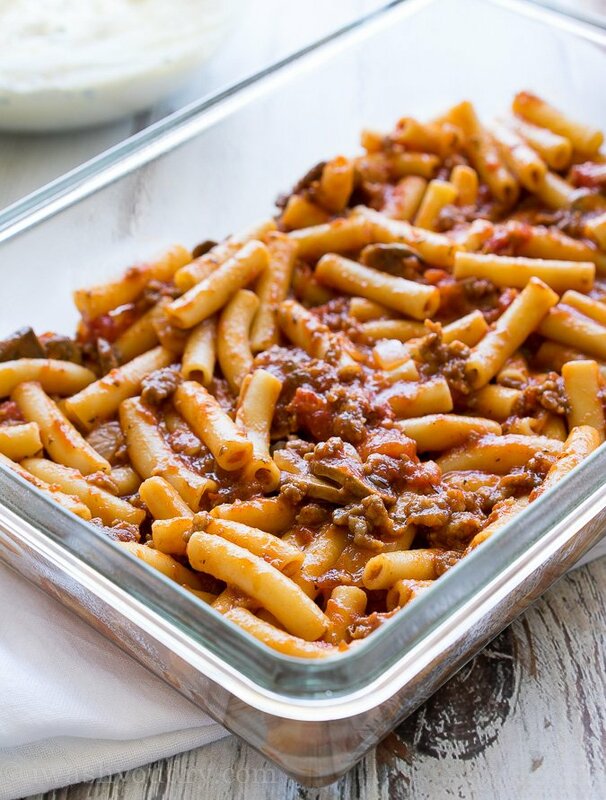 I love the sauce so much, that I also like to make it as just a pasta sauce if I don’t have the ingredients on hand for the filling (although the filling really does ‘make’ the ziti!). Absolutely delicious! Awesome! I’m so glad you’re loving it! And yes, that sauce… swoon!! I am making some lasagna to freeze and give to a friend when she gets home from the hospital where her adult daughter is for a few days. Much like your ziti, my lasagna has everything from noodles to meat sauce to cottage, mozzarella, and parmesan cheeses to raw eggs. I didn’t know if I needed to just assemble the lasagna and then freeze it BEFORE baking, or if I needed to assemble it, bake it, then freeze it. Judging from your post, I need to assemble and freeze… no baking prior to my friend’s thawing and cooking for eating. Is that correct? I never have enough freezer meal recipes!! This looks out of this world! 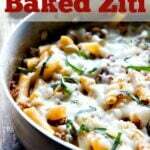 I definitely need a batch of your fabulous ziti to eat immediately, then another for the freezer! Those Zyliss containers look incredible—time to stock up! Okay, I need these containers. I freeze a lot of pasta and most containers don’t seal well enough. So glad you tested this out. I need to get my hands on one, or ten, or twenty. This recipe is stellar. I just want to dig right in. I adore pasta and could eat it every single day. This one is making me want to head into the kitchen immediately. But it’s 1 am. I made this over the weekend and it was so good! Reminded me of a restaurant in town here. Will definitely be making again! Those containers look awesome! Thanks for the discount! 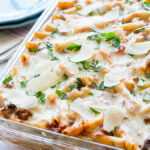 I am going to make this baked ziti to keep in the freezer for when I have my baby next month! Thank you! !